A meatloaf recipe can bring looks of boredom from the casual meatloaf consumer. But, this is my "Jacked Up Meatloaf." Even Randy from The Christmas Story would love it. Even though I do this recipe on a Weber grill, it can just as easily be done in the oven, although the grill does add a smokiness that in truly unique to meatloaf. The key is to saute' the onions and garlic and to use pork in addition to beef. 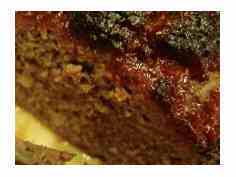 Leave Meatloaf Recipe and Return to BBQMyWay Homepage.